Causes: Age – accumulated microstains over a lifetime. 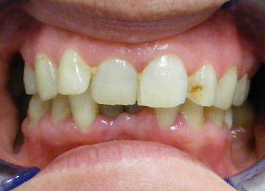 enamel imperfections caused by childhood fever, some antibiotics taken as a child. 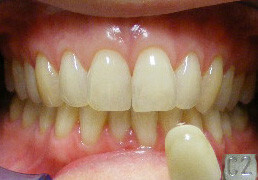 Solution: Whitening with POLA gel. 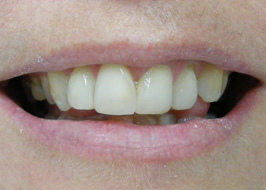 Enamel will lighten when whitening gel contacts the teeth. The longer the contact time, the whiter they become – to a point. Although we can offer whitening in the dental chair at a higher concentration of gel, the preferred method is to custom make whitening gel trays for use at home. The benefits are that you can control how much whitening you would like by doing repeated exposures at home. The home gel is more gentle on the teeth and gums and can even be used overnight. Although the dental chair POLA gel is stronger and works more quickly, it can be more uncomfortable because of the higher concentrations of gel used. We prefer the safest and most effective method. Risks: Sensitivity: If you have sensitive teeth already, proceed with caution. 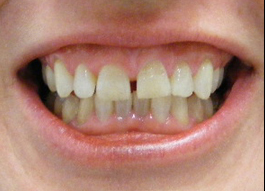 Amount of whitening: Some teeth whiten dramatically and some change only mildly. It is impossible to know how much they will lighten but a general rule of thumb is the yellower they are to start with, the more noticeable the result. 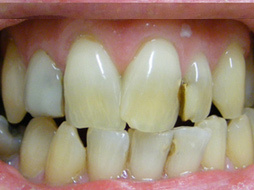 Also some intrinsic stains (white, orange or brown areas) are deep within the tooth and will not lighten with the gel. Your dentist will discuss. Cosmetic consultation is $60. All questions answered. 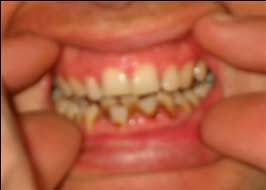 Brown stain cause by certain mouthwashes containing chlorhexidine. It is completely superficial and can easily be removed by an ultrasonic scaler. After a scale and polish at the dentist, there is no more stain. Causes: Smoking, red wine, coffee, tea, beetroot, some mouthwashes (containing active ingredient chlorhexidine), calculus scale build up. Calculus (tartar) is a natural calcium deposit on the teeth. Some people have heavy calculus staining and some have no calculus. Solution: A professional clean and polish at the dentist can remove superficial stains. Stains will return with time, so regular 6 monthly cleans are advised. Some may need more frequent cleaning and some less. 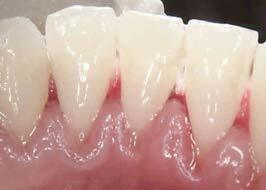 Calculus build up can lead to periodontitis. 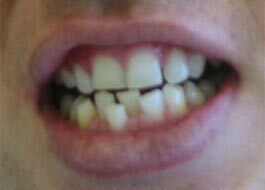 Front tooth has darkened after the nerve has died. After root canal treatment, the tooth was bleached from the inside out. Causes: The pulp inside the tooth can die from trauma like a knock on the tooth, or bacterial invasion (usually dental decay). Solution: The bruised tooth needs to have the dead pulp tissue removed with root canal treatment. 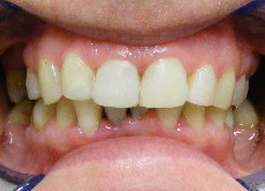 Once complete, the discolouration can be bleached out from within the tooth. A small hole is drilled behind the front and bleach paste is left in the tooth for a couple of days. Up to 3 repeat treatments may be required. 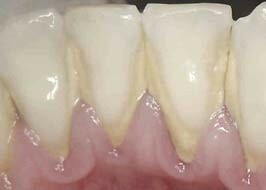 Causes: Old fillings become stained, chips and fractures repeatedly break. Solution: Remove the stains, starting with the simplest options. Solutions: 1. Clean and polish – possibly with abrasive paste. 2. Whitening with Pola whitening gel. 3. Deep stains will need to be drilled out and refilled with composite resin. The versatility of composite resin means that dentists can not only refill the hole, but also reshape the entire tooth. Prices vary depending on complexity. 4. 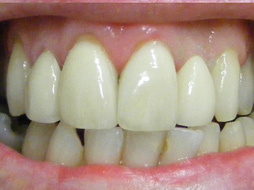 Porcelain dentistry, with porcelain veneers and crowns. 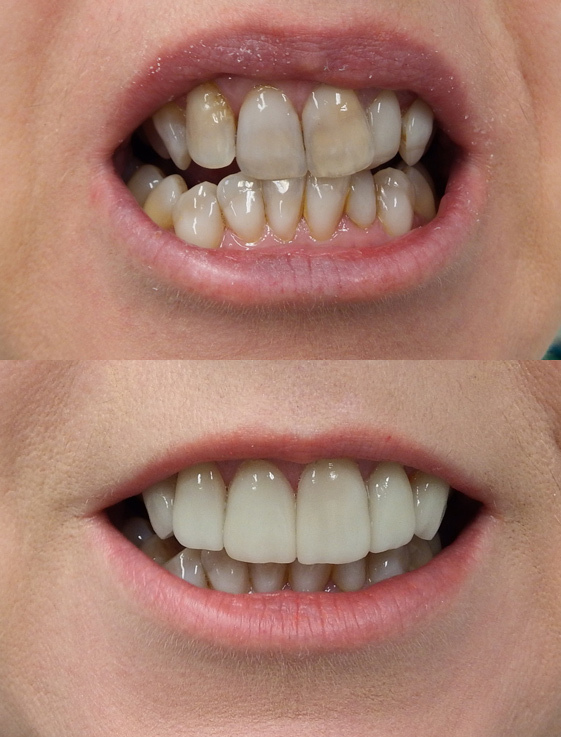 For superior aesthetics, strength and longevity, porcelain crowns can provide a long term solution. The costs are higher for this type of dentistry, but the quality is much higher than for composite resin. Imagine eating off a plastic plate vs a ceramic plate. 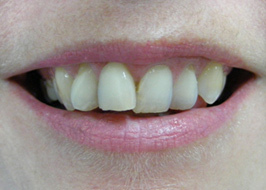 Attempts were previously made to mask the metal fillings, but the patient wanted something better. Causes: Teeth are smaller than the bony dental arch. Teeth may have drifted apart. (Note that drifting teeth may be a sign of periodontitis in people over 30 years old). Solution: Composite resin veneers are hand sculpted by the dentist directly onto the teeth. Causes: Teeth are too big for the bony dental arch. 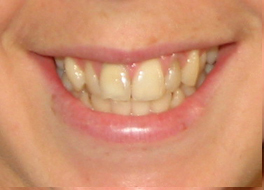 Solution 2: A simpler solution for an adult would be to re-sculpt the teeth with composite resin veneers. 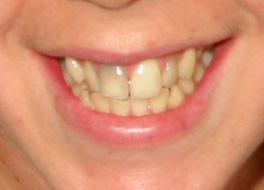 Solution 1: Braces, however this would not fix the colour. Plus as an adult, braces were not desired. If you would like a quote for cosmetic dentistry, please contact our practice for an appointment. The fee is $60 and from there we can give you all the options to turn your smile into one worth smiling about! 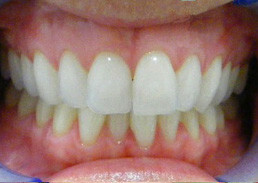 All photos are actual cases done by the dentists at Bytes Dental. 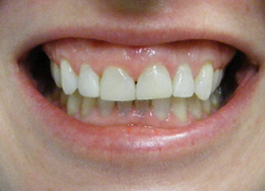 More before and after photos on the main Bytes Dental website.